Dogs are remarkably good at fitting in with and adapting to our lifestyles. That’s why Beryl and Penny are currently curled up under my desk, busy keeping my feet warm as opposed to running across the prairie in wild wolfy packs (and definitely not being called Beryl and Penny while they’re at it!). But sometimes that incredible adaptability and empathy can lead to confusion. A little Cockerpoo came to stay recently who is the life and soul at home, but who is afraid of dogs, new people, loud bangs and so on when away from home. It was a bit of a risk having her come to stay at the House of Mutt, where she’d never been before and knew no-one, but her owners and I had a good long chat about it and both came to the conclusion that all would be fine. It was fine. She came out from under the table when she was good and ready, and by the end of her stay was dashing round with other dogs, leading the charge at meal times and happily reserving her place in the back of the Land Rover for long and exciting walks. Getting from start-dog to end-dog was a matter of time (fairly obvious really) and, more importantly, of space. Day 2 – made it from crate to being under the desk. Ditto re dashed forays for food and wees. Day 3 – she joined us outside in the garden, sitting around with other dogs. No fanfare, she sidled up. And skittered back to her crate-base when she wanted to. She came on her first proper walk with the other dogs . Front seat of the Land Rover, and on lead; but she was out with us all and starting to wag. Day 4 – she joined us for breakfast. And tea. And put herself in the back of the Land Rover with the other dogs for the walk. And didn’t mind that her crate door was closed and she therefore had to sleep on the bed outside the crate. Day 5 – she initiated play in the garden. And was off lead for walks. And was fed alongside a giant Leonburger. The crate was removed completely. Day 6 and onwards – sorted, one of the pack. Taking all attention off her and leaving her to get on with working out for herself how to cope, seemed to be the answer. We’re so lucky here to have the time and the space to be able to do that – to be able to take away all pressure or expectation, and let them safely work things out for themselves. It would obviously be impossible around unknown dogs in the park and where physical boundaries are lacking – but here where both are under control, it’s really interesting to see how nervous dogs can learn themselves out of nervousness. And to cope themselves instead of relying on their interpretation of what their boss species may or may not be wanting them to do. This isn’t a problem the average Jack Russell has (! 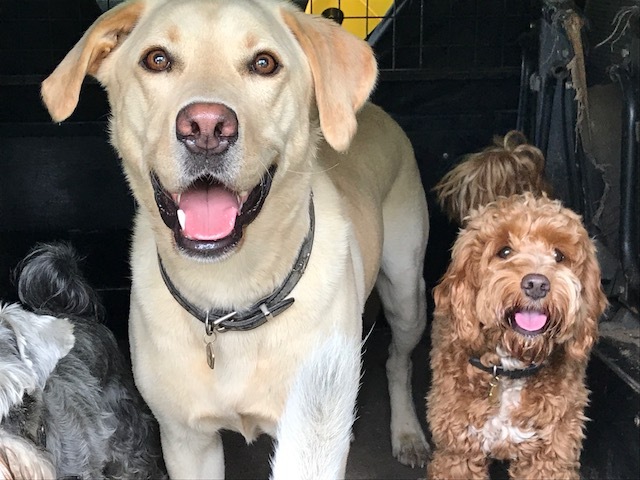 ), but for these extremely biddable, people-pleasing dogs like Cockerpoos, perhaps the odd puppy-go-wild party would be a better idea than puppy-training – allowing them to let their hair down, relax, work out for themselves how to approach new dogs and new places. It’s a complicated world out there if you really, really care what other people think! Maybe the next big crossbreed should be Cockerpoo/Basset Hound – that should knock the empathy out of them! !